An Indian and a Retailer! : The MRP Scam !! I have been writing and speaking a lot about the irrelevance of MRP and also how most establishments flout this rule with impunity. 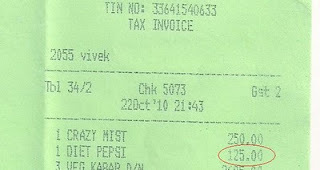 See the scanned picture of the bill which illustrates the point. Recently we went to a restaurant for dinner and ended up paying Rs. 125/- for a can of Diet Pepsi! Most restaurants get around the MRP rule by serving the soft drinks in a glass and billing it as soft drink. Whereas in this place they happily brought the can to the table and have blatantly charged Diet Pepsi at almost 4 times the MRP! Adding insult to injury is the fact that this is printed on a tax invoice. This means that such bills are supposedly inspected by the sales tax officials once in a way. Does that mean that the sales tax department is not aware of the MRP rule or in true bureaucratic style one arm of the government is not bothered about a violation with regard to another!